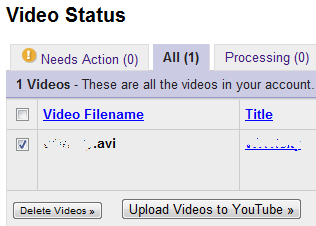 Google had initially plan to stop hosting and playbacks of videos on Google Video from April 29, 2011, but has since reversed course to allow vidoes that have already been uploaded to Google Video to stay and continue to be usable, and any embed code to Google Video will continue to work and playable. Google Videos, its current name, is still been slated to become a pure video searching portal. Initially, Google only provides users with option to download videos currently hosted on Google Video platform. You must be wondering why can’t Google automatically transfer and port all videos on Google Video to Youtube, since two entities belong to Google ultimately. Now, to help users with migration from Google Video to Youtube, Google decides to eliminate the April 29 deadline. And that means all videos hosted on Google Video will remain accessible on the web and existing links to Google Videos will remain accessible. Visit YouTube, and sign in or create an account using Google Account which was used to login and upload videos on Google Video so that the Google Video account is associated and liked with YouTube account. If you already have a YouTube account which linked with your Google Video account, ignore this step. Click on the Uploaded Videos link. Click and select the checkbox next to each video that you want to upload to YouTube, and then click Upload Videos to YouTube at the bottom of your list of videos. A YouTube page will be opened after uploading which allows you to Publish the video right away. User can edit the video details after publishing. 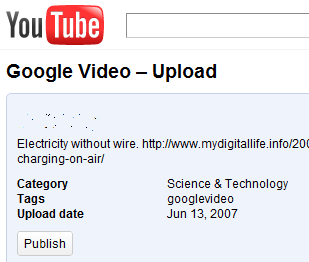 Once a video has been uploaded, “Upload to YouTube” will appear next to the “Download Video” link. After verifying that the videos have been posted on YouTube, you may want to update embed code (Google doesn’t specify if Google Video embed code will continue to work after full automatic migration in future), or delete the videos from Google Videos. NOTE: If you have a large number of videos on Google Video, you may want to wait until Google Video team launches a simple full account migration to YouTube feature.